Pneumococcal illnesses are dangerous for people with compromised immune systems – 20 times higher according to www.medscape.com. As we get older additional vaccines are recommended including the PV13 and PPSV23 pneumonia shots as well as influenza, varicella, zoster (shingles) and hepatitis B. Soon to be 49 years old, I have my eye on what is coming up for me. Last weekend I received the PV13 shot. Having had a severe case of viral pneumonia at 28 years old and the Asian flu at 29, I absolutely never want to have those things happen to me again. The PV13 doesn’t have guaranteed results of prevention but it is suppose to decrease the severity and longevity should I contract one of these 13 illnesses. 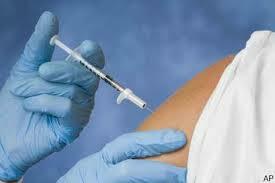 Do NOT receive live vaccinations because the disease is only weakened. Inactive vaccines are safer for MS patients. Consult your neurologist before taking a live vaccine. Speak to your neurologist before a close family member receives a live virus vaccine. Experts do not agree on a protocol at this time.